Building an email list is easy specially when you’re using OptinMonster. However engaging and converting those subscribers into customers require creating follow up email sequence, billing system integration, and analytics. 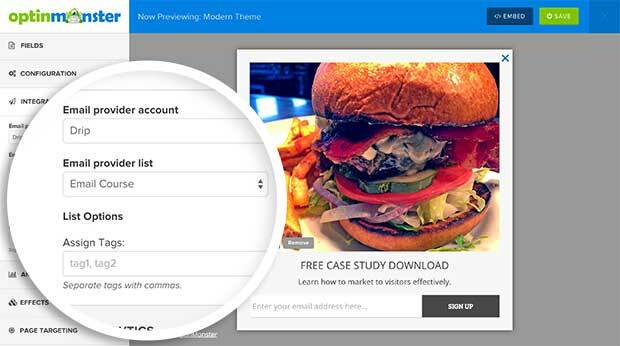 Drip is a lightweight marketing automation platform that’s easy to use without the high costs. Today, we’re excited to announce OptinMonster’s Drip integration. With this integration, you can combine the power of OptinMonster’s high-converting forms with Drip’s easy to use follow up emails. You can send subscribers directly to specific campaigns in Drip with unique tags that you specify. The integration is very simple. All you have to do is connect your Drip ID to OptinMonster which will show your Drip Email Lists in the builder and allow you to assign tags. Now you can send your subscribers directly to a lead-nurturing Drip campaign, crash course, or lead magnet. With OptinMonster, you can run tests on which forms and pages are converting the best. See our full OptinMonster Drip integration tutorial. OptinMonster now integrates with 21+ email marketing services. What other email marketing service should we integrate with? Leave a comment below to let us know. If you’re not using OptinMonster, and you’re itching to try out OptinMonster’s new Drip integration, then you should try OptinMonster today and see why it is the most powerful lead generation software in the market.